When you think about the highly regarded Carnegie Museums of Pittsburgh, the first thing that often comes to mind is its long-extinct dinosaurs. But, far from living in the past, the museums’ newest addition is considerably alive, smart, enthusiastic, and ready to propel the quartet of Carnegie Museums to even higher levels. 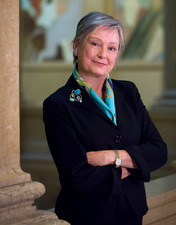 She is Jo Ellen Parker, the first woman to serve as the museums’ president and chief executive officer. A graduate of the University of Kansas and Bryn Mawr College, Dr. Parker earned her Ph.D. from the University of Pennsylvania. Prior to being drawn to this position, she served for five years as the president of Sweet Briar College in Virginia. North Hills Monthly Magazine (NHMM): I’m sure that our readers would like to know who you are. What can you tell us about yourself? Dr. Jo Ellen Parker: I’m a kid from Kansas. I just got very lucky in my education, which I attribute to my family, which was not necessarily highly educated. While my grandparents stopped school after the eighth grade, it was still a family that really understood the importance of books, art, music, culture and, coincidentally, museums. I was taught very early that education was the one thing in your life that you could never lose. I ended up getting my Ph.D., as did several of my cousins. There was one point when it happened that two of us were serving as college presidents. I say this to emphasize how very important it is for people of any background and from any level of educational attainment to value education; to value art, music and literature. They should use libraries, use museums, and go to concerts and the theater. Not only will this change someone’s life, it also can change families’ lives for generations to come. NHMM: You certainly get an ‘A’ for that answer. You’re now responsible for the four Carnegie museums: Art, Natural History, the Science Center and the Andy Warhol. What are your plans? Dr. Parker: I’ve only been here about nine months, and we are just beginning to make specific concrete plans. We do, however, have themes that we know are going to inform our planning as we move forward. Those themes are about providing informal educational experiences to the public and about being socially inclusive. We are making sure that people from all backgrounds—economic, racial, all levels of educational attainment and all ages—find something valuable in each of our museums. It’s also about thinking innovatively about technology—I’d like to see our museums become more digitally sophisticated. Technology can really help us reach new audiences and show people new kinds of experiences. So, in brief, we’re going to be looking at strengthening our leadership and informal education for a socially inclusive body of patrons in a technologically sophisticated way. NHMM: How can you measure how important the Carnegie Museums are to Pittsburgh? Dr. Parker: I can tell how important these museums are to people in Pittsburgh simply by the way their faces light up when they find out that I work here. This happens frequently, but here is one example. When I went to get my Pennsylvania driver’s license, there was a little complication. A wonderful fellow at the driver’s license bureau was really trying to help me, but it was taking some time for a process to happen and he asked why I moved here. When I told him I got a new job at the Carnegie Museums, he said, “Wow!” and got a big smile. He couldn’t wait to tell me about being a Boy Scout leader and how much his scouts love to come every year to see the dinosaurs. Suddenly, I felt like the most important person in the DMV. Still smiling he said, “I’ll get you out as fast as possible, but is that dinosaur in the corner real or a replica?” My own neighbors light up when they talk about what happened or what they saw at the Warhol or the science center. To experience that kind of affection from anyone who finds out where I work is something that cannot be measured, except to say that it’s extremely positive and priceless. NHMM: When we think about the Carnegie Museums, there is more variety among them than a person can imagine. I have to ask, do you have a favorite? Dr. Parker: (Laughing) Now, that really is a hard question. I sometimes jokingly talk about these as a mother of a family with four children. And, believe me, these four children not only have very different personalities, but they have very different interests. Nevertheless, they are each a Carnegie, and there is no doubt about that. We even talk about the Carnegie resemblance. The Museum of Natural History and the Carnegie Science Center are definitely siblings, but definitely different. ‘Andy Carnegie’ over at the Warhol is a different kid. There is no argument that he is even a very different kid. Just compare that one, the Warhol, to the one we call ‘Art Carnegie’ over here in the art museum. Andy and Art are certainly two different kids with different personalities and interests, but if you study them closely, you can see a family resemblance. I think that the vitality and the fun of this family are those differences. We want each of the four to have their differences, styles, and personalities and even their missions, but in the end, as Carnegies, they are each reaching out to the public, giving people experiences that matter to them in the context of the arts and culture. And they all are very much about Pittsburgh. For more information, visit www.carnegiemuseums.org.